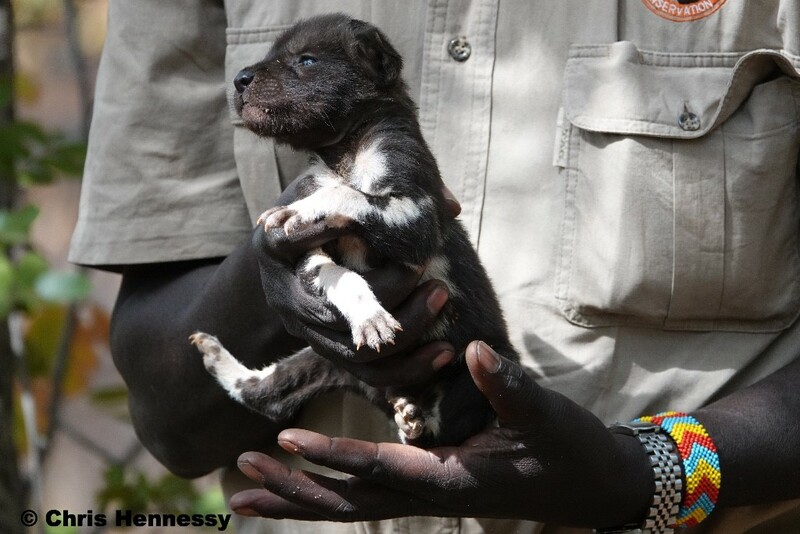 I have just read Painted Dog Conservation’s newsletter about the rescue of a painted dog pair and their pups that had denned in a village 100km south east of PDC – three hours drive away. PDC trapped the two adults then dug the pups out. The den was two metres below ground and reached by a tunnel that extends down at a 45 degree angle for more than seven metres. The family where taken to PDC’s Rehabilitation Centre until the pups are big enough to follow their parents on their nomadic wanderings. What is remarkable about this story is that the village got in touch with PDC. The impoverished villagers said the predation by the adults was just too much and they had heard about PDC’s work even though they are not a community that PDC interacts with. The villagers gave PDC the chance to remove the family before they took matters in to their own hands even though they were loosing livestock to predation. WVI believes that the only way to conserve endangered species is to work with organisations and networks that cover a range of conservation activities. We help them with a small part of a bigger picture, often underpinning the other conservation activities. What is our link to this puppy rescue? Nothing directly. But by collectively running vaccination and neutering clinics we provide PDC with another chance to provide a service to the community in the name of painted dogs. We have a captive audience where the vets can talk about reproductive biology, animal health – sexually transmitted diseases in particular! – human health, WVI’s relationship with PDC and PDC’s conservation activities namely the outreach, Children’s Bush Camp and anti-poaching. In this short clip, WVI and PDC patron Steve Leonard talks to PDC’s Executive Director, Peter Blinston, about why the neutering clinics are important. It was PDC’s increasing reputation the lead this village to contact PDC and put up with the livestock predation rather than kill the dogs themselves. With the death of a local pack to rabies last Christmas and the decimation of a local population in Kenya to canine distemper virus in September 2017, it is key that we continue to support PDC with the veterinary resources that they need. On that note, I had best get back to chasing up the vaccine for next month’s clinic. Thank you to PDC UK for sponsoring them. And find some match funding for The Big Give Christmas Challenge 2018 as we have decided to raise funds for this project.